D-100 has a slim, aerodynamic profile, bright status-LEDs on the back corners and an illuminated zone facing backwards. It is suitable for magnet fixings, side-fixings and roof racks. Take the brilliant D-100, add an integrated dual-sided advertising sign and you have the D-200. You also get two more illuminated zones a status-LED bar that enhances the status LEDs on the front sign. The D-500 has the same bright 3-color display as the D-100, but has an integrated magnet fixing. 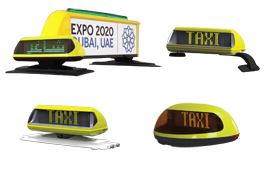 It also features status LEDs on the back corners and an illuminated TAXI-zone on the back.